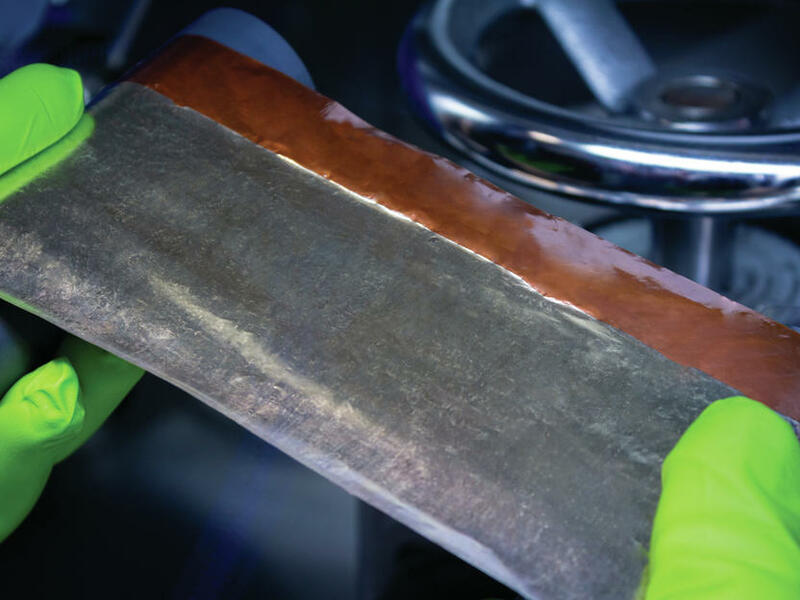 Lithium coating on copper foil created by IWS melt deposition: The process already permits producing prototype cells with lithium anode layers of 5 to 30 micrometers in thickness. Fraunhofer IWS scientists headed by Dr. Holger Althues have developed an innovative process for the cost-efficient production of thin lithium anodes made of molten lithium. In the BMBF-funded “MaLiBa” project, the Dresden Institute is working with the companies hpulcas and SGS as well as with scientists led by Prof. Dr. Jürgen Janek of the Justus Liebig University in Giessen to solve further crucial issues relating to this concept. The most important innovation consists in realizing an anode compound. This contains a few micrometers thick nickel foil with lithium film stabilized by means of protective layers. Lithium-metal anodes are regarded as key elements for battery systems of the future. They enable the energy density to be maximized both in terms of cell volume and mass. The lithium metal anode is already being used in lithium sulfur cells to achieve record specific energy values of more than 400 watt hours per kilogram. By comparison, the best lithium-ion battery cells currently only achieve 250 watt hours per kilogram. In addition, solid state batteries could exceed the volumetric energy density of today's lithium-ion batteries by more than 70 percent using the lithium metal anode. Conventional production solutions for lithium foils include rolling processes. Their disadvantage is the fact that the production of films with less than 50 micrometers over large areas is very challenging. The quality is also limited, as auxiliary materials or lubricants chemically contaminate the surface. Thus lithium foils cannot be produced on an industrial scale with the quality requirements necessary for battery applications. In addition, production technologies for high-quality and thin lithium coatings are not yet commercially available and the interface between lithium and other cell components is highly reactive. This in turn requires interface engineering to enable stable and safe use of the lithium anodes.